Its major export partners are the United States, Panama, and China. Its main exports are petroleum, coal, emeralds, and coffee. Its major import partners are the United States,China, and Mexico. Its major imports include industrial equipment, transportation equipment, and consumer goods. Located in Northern South America, Colombia has a 6,672.00 km border with Brazil (1,790 km), Ecuador (708 km), Panama (339 km), Peru (1,494 km) and Venezuela (2,341 km). It has a 3,208.00 km coastline. There have been disputes involving the martime boundary that exists with Nicaragua. The capital of Colombia is Bogotá, which is located in the Altiplano Cundiboyacense in the southeastern region of the country. This city was founded on August 6, 1538 by Spanish colonialists to serve as the capital of the New Kingdom of Granada and has maintained its status as capital since then. With the city limits, Bogotá has a population size of just over 8 million individuals. The population for the entire metropolitan area is more than 10 million, making this city the most populated in Colombia. Bogotá is a popular destination for tourists and, in fact, generates more than half of the tourism industry in Colombia. Some of the most popular destinations here include museums, parks, and viewpoints. Bogotá is located within a subtropical highland climate range, which means it is similar to an oceanic climate with mild summers and relatively dry winters. 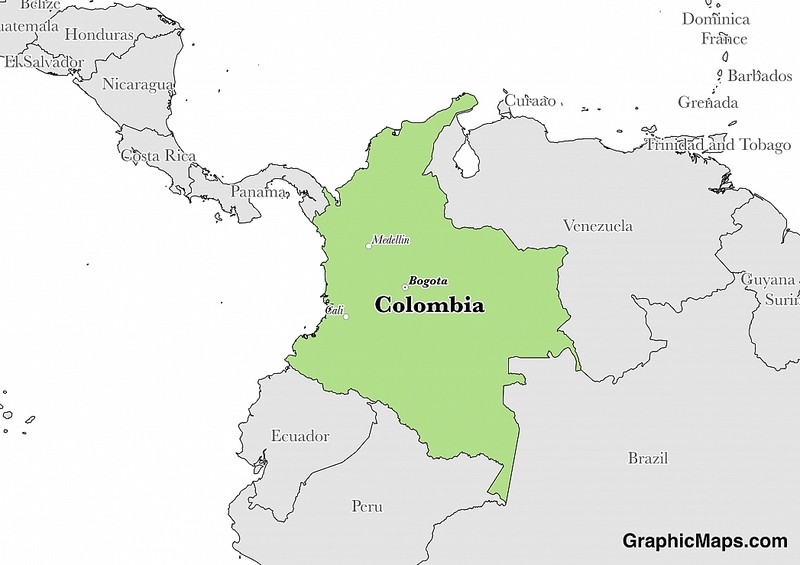 Colombia is a South American country covering 1,138,910.00 km2 of which 8.80% is water and 1,038,700.00 km2 is land. This makes it the 25th largest country in the world and slightly less than twice the size of Texas. Its geographic coordinates are 4 00 N, 72 00 W and Bogota is the capital city. The country is named for explorer Christopher Columbus. Its ISO code is CO.
Colombia has a mean elevation of 593 m above sea level. Pico Simon Bolivar also has the same elevation at 5775 m.
It has a tropical climate along the coast and in the eastern plains; it is cooler in the highlands. Its terrain consists of flat coastal lowlands, central highlands, high Andes mountains, and eastern lowland plains. Colombia has a population of 47,220,856 making it the 29th largest in the world. The majority lives in the north and the west of the country. Spanish is the official language. The majority ethnic groups are mestizo and white, Afro-Colombian, and Amerindian. Catholicism is the majority religion in Colombia. The official language of Colombia is Spanish, although a number of other languages are spoken throughout this country. English has also been given official status at a provincial level on the San Andres, Providencia, and Santa Catalina islands. Less than 10% of the population, however, speaks English. Around 99.2% of the population of Colombia speaks the Spanish language, which has at least 11 regional dialects throughout the country. In addition to Spanish and English, linguists have identified a little over 100 other living languages used in Colombia. Palenquero, the only Spanish-based creole language in the Americas, is one of the most widely spoken minority languages here and Vlax Romani is one of the most common immigrant languages. The dialing code for the country is 57. Colombia is an independent country. It gained independence from Spain in 1810. Its constitution was last ratified in 1991. The government of Colombia is a representative democratic republic, which operates based on public elections. The President of Colombia leads the country as both the Head of State and the Head of Government. As of recent law amendment, the president may only serve one 4-year term. Legislative duties are carried out by the Congress of Colombia, which consists of two houses: the Senate and the Chamber of Representatives. These individuals hold sessions at the National Capitol building in the Bolivar Square of Bogotá and are also limited to a 4-year term in office. Voting in Colombia has been mandatory since 2014. Factoring in Purchasing Power Parity, Colombia's GDP is $688,000,000,000.00 (USD) with $14,100.00 (USD) per capita. This makes it the 31st largest economy and its citizens the 112th richest in the world. The currency of Colombia is the Peso (COP). Its major export partners are the United States, Panama, and China. Its main exports are petroleum, coal, emeralds, and coffee. Its major import partners are the United States,China, and Mexico. Its major imports include industrial equipment, transportation equipment, and consumer goods. The flag of Colombia is made up 3 horizontal stripes of varying widths and colors. The top color, which takes up half of the flag is yellow. This is followed by a blue and red stripe that make up the bottom half. Colombia officially adopted its flag on November 26, 1861. Its current design is based on the original flag that was created by Francisco de Miranda, who was involved in the South American independence movement. Each of the colors on this flag has a specific meaning. The original flag went on to influence the flags of Venezuela and Ecuador. Colombia celebrates Flag Day on August 7th every year as a way to commemorate the Battle of Boyacá.